Grandview Drive before roundabouts, bike lanes, and other improvements were added. Grandview Drive is a secondary arterial in University Place, Washington, that provides access to a high school, middle school, and over 200 residents before ending at the city's undeveloped 700-acre waterfront. The one-mile stretch of road did not have any pedestrian or bicycle facilities, and although the speed limit on the road was marked as 35 mi/h, the average speed was as high as 42 to 45 mi/h. Therefore, children bicycling and walking to school were forced to negotiate this commuteadjacent to high speed vehiclesby walking on the edge of travel lanes. Additionally, at Olympic Drive, a four-way stop caused traffic to back up hundreds of feet in every direction during peak hours. Many impatient drivers, waiting to cross the intersection, did not pay attention to the pedestrians and bicyclists who were trying to cross the roadway. Diagram of conflict points at roundabout and conventional four-way intersections. Each dot represents a potential conflict point between road users. In 1996, the University Place Council and staff launched a public involvement process to determine improvement options for Grandview Drive. After many public meetings, the City Council decided to build Washington State's first modern roundabout at the intersection of Grandview Drive and Olympic Drive. Initially, there was overwhelming opposition to the roundabout from the community. Many residents were concerned that it would create more safety problems for pedestrian and bicyclists. In response, the Council chose to build a temporary roundabout for 12 months. At the end of the 12-month period, an analysis would be conducted to help decide the fate of the roundabout, including an assessment of the community's acceptance along with technical data. The city conducted extensive research on roundabouts. The research suggested that fewer and less severe accidents could be expected with roundabout-controlled intersections than with signal- or stop-controlled intersections. While there are 32 potential conflict points at a conventional (sign or signal controlled) intersection, there are only 12 potential conflict points in a roundabout. After the test period, community acceptance of the roundabout was measured at more than 75 percent, so the Council decided to keep it as a permanent traffic control device. Ultimately, the entire roadway was reconstructed with curbs, gutters, sidewalks, bike lanes, planter strips and street lighting. Later, four additional roundabouts were constructed on Grandview Drive, along with four midblock school crosswalks with beacons. Redesigned Grandview Drive with roundabout, bike lanes, crosswalks, curb and sidewalk with buffer strips and enhanced lighting. The roundabout reduced the number of conflict areas and crashes previously associated with the intersection, thus providing a safety benefit for bicyclists. The addition of pedestrian and bicycle facilities to the road and intersection have increased safety and comfort for these users. Today, bicyclists have access to bike lines on the entire length of Grandview Drive. Average speed at a midblock location on Grandview Drive was lowered from over 40 mi/h to 32 mi/h. Another study of midday speeds found that the design with the roundabout and pedestrian and bicycle enhancements reduced average speeds by 4.1 mi/h without the support of increased enforcement. Average midday speeds on a parallel roadway that was targeted with heavy enforcement, but did not have any design changes, experienced a reduction of only 0.8 mi/h. Traffic volumes remained constant from the before period (1994) to the after period (2001). Because the roadway design is much more aesthetically-pleasing, residents now consider Grandview Drive to be the city's "linear park" as it connects to the waterfront. No official pedestrian count data were collected, but pedestrian activity has increased along Grandview Drive. According to Steve Sugg of the University Place Public Works Department said, "sidewalks brought the people out." 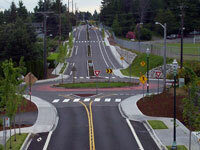 After the Grandview Drive project was completed, the Washington State Department of Transportation developed roundabout guidelines and many communities in Washington State built roundabouts. The first roundabout, at Grandview and Olympic Drives, cost only $20,000 more than the projected cost of the traditional intersection improvement that was initially planned and designed for the location. The entire project cost $6.15 million and was funded and built in three phases. 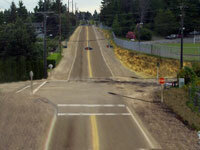 It includes five roundabouts and over three miles of reconstructed roadway. Funding came from a variety of sources, including city general funds (roughly $3 million), a low interest loan from a state public works revolving loan fund ($1.8 million), local bonds ($1 million), county funds, donated right-of-way ($320,000), and a contribution from a local gravel business ($50,000).